Revenue in the Event Tickets segment amounts to US$30,579m in 2019. Revenue is expected to show an annual growth rate (CAGR 2019-2023) of 7.2%, resulting in a market volume of US$40,384m by 2023. The market's largest segment is Music Events with a market volume of US$15,611m in 2019. In global comparison, most revenue is generated in United States (US$30,579m in 2019). The Event Tickets segment includes the sale of tickets for sporting and music events purchased online as well as cinema tickets. Paid reservations and digital tickets that can be scanned via QR codes are included. Ticket ‘users’ are counted as the active purchasers of the event tickets, independent of the number of tickets bought. The following are not included: tickets for museums, theatres, cabarets or comedy clubs. Reading Support Revenue in the Event Tickets segment amounts to US$30,579m in 2019. Reading Support The Event Tickets segment is expected to show a revenue growth of 9.2% in 2020. Reading Support In the Music Events segment, the number of users is expected to amount to 90.3m by 2023. 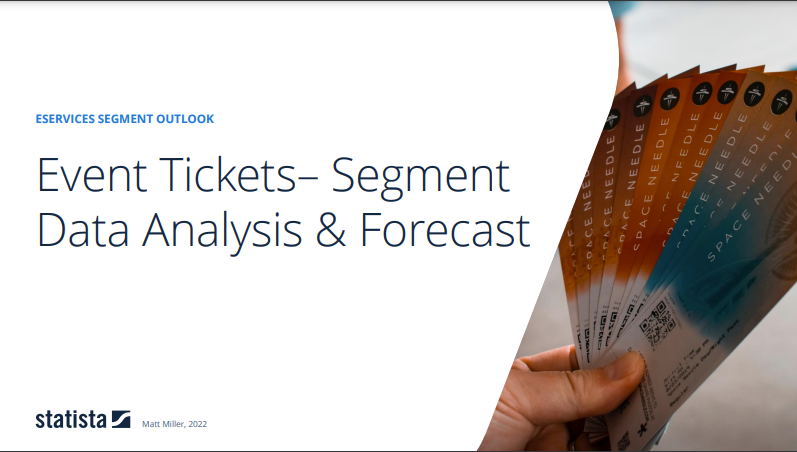 Reading Support User penetration in the Event Tickets segment is at 35.3% in 2019. Reading Support The average revenue per user (ARPU) in the Music Events segment amounts to US$191.34 in 2019. Reading Support In the year 2017 a share of 32.6% of users is 25-34 years old. Reading Support In the year 2017 a share of 51.7% of users is male. Reading Support In the year 2017 a share of 42.5% of users is in the high income group. Reading Support With a market volume of US$30,579m in 2019, most revenue is generated in United States. Reading Support With a rate of 39.2%, the user penetration in the Event Tickets segment is highest in Finland. Here you can find more studies and statistics about "Event Tickets".